Every year, the Pulitzer Prize awards notable achievements in newspaper, online journalism, literature, and musical composition in the United States. The Pulitzer Prize for Fiction is arguably the most well known, and hundreds of books compete for the coveted golden stamp. Yet this year, a lesser-known category has taken the spotlight: the Pulitzer Prize for Music. The prize was awarded to the album DAMN. by Kendrick Lamar, marking the first time a music Pulitzer was given to any work that wasn’t classical or jazz. Public reaction was mixed. Predictably, some reacted with derision. Various music critics turned up their noses at the genre and wrote scathing reviews. One critic from The Washington Post declared, “you can’t spell crap without rap.” While there is not enough space to list them all, there are surely other mocking reviews hidden in the snobby, antagonistic, and occasionally racist recesses of the internet. To be fair, the difference in popularity is notable. Lamar’s DAMN. reached No. 1 on the pop chart and generated over two million dollars in revenue. The other finalists for the Pulitzer Prize were Michael Gilbertson, who wrote a string quartet, and Ted Hearne, who wrote a five-movement cantata. These pieces, while popular in their own right, definitely never made it onto the pop charts or into mainstream music consciousness and thus did not gain the same kind of financial success for the creator. However, even though the anxiety is understandable, it is irrelevant to the goal of the Prize. Pulitzer Prizes should not yield to popularity, but they also shouldn't avoid it altogether. Sometimes the most deserving piece will also make the most money, and sometimes the second best piece will make no money at all; that’s life. If awards were granted based on how much the recipients needed the money, then they would lose meaning altogether. The Atlantic agreed, stating, “The ability to hear hip-hop as brilliant music, period, is overdue for institutions and observers of all kind.” Similarly, Jon Pareles, the chief pop music critic for The New York Times, said, “if you ask me, it should have happened sooner.” Other publications have also chimed in with comparable sentiments, thrilled that the Pulitzers are opening up new doors and starting to appreciate all genres of music equally. Regardless of which position you take, it’s safe to say that the 2018 Pulitzer Prize for Music has prompted public dialogue. But it’s important to note that dialogue seems to center on the Pulitzers rather than the album. 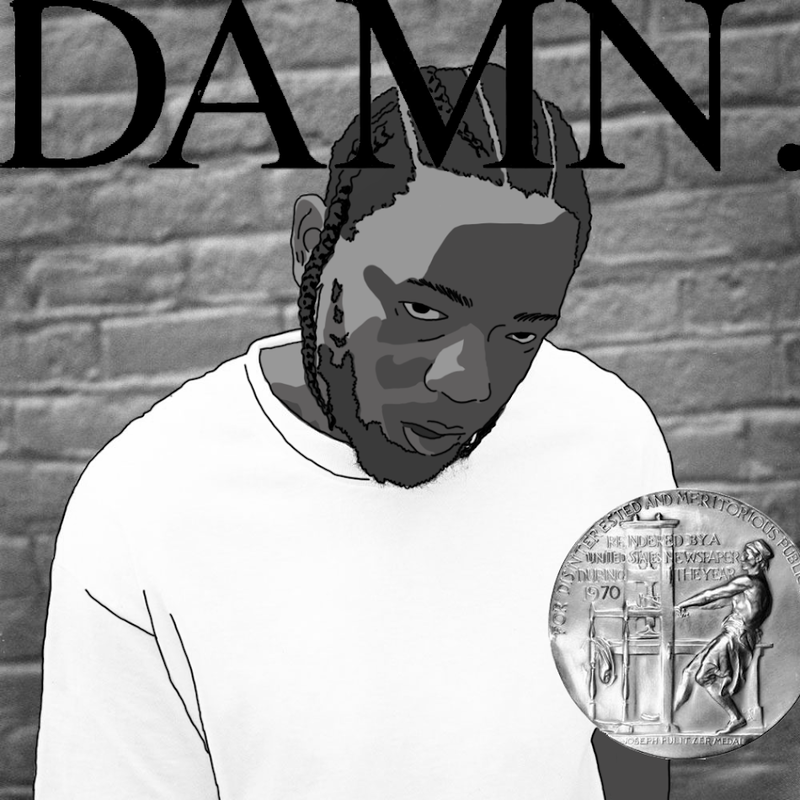 The story is not that Lamar won a Pulitzer Prize, but that the Pulitzers gave a prize to Lamar. Indeed, the Pulitzers do seem to get the better end of the deal. Lamar gets recognition and accolades, but he was already famous, and the cash prize pales in comparison to the profit generated by the album. The Pulitzers, on the other hand, have been lauded as progressive. Their music prize is in the news for the first time in years. They refurbished their image over the course of a single voting session, transforming from antiquated institution to open-minded music authority. Furthermore, the Pulitzers did not even consider Lamar’s album in the beginning. According to The Atlantic, “Lamar’s work entered the discussion once [the judging panel] realized that some of the modern classical artists they were evaluating bore clear hip-hop influence.” They consequently decided to go back to the source of that influence, and Lamar seemed the best place to start. So the timing had to be right, and the judges had to recognize hip-hop’s influence in other music before considering it on its own merits. It’s possible — likely, even — that other external factors crept into the supposedly impartial judging room. These factors lined up to catapult DAMN. to victory, but does that make the Pulitzers deserving of praise? Overall, Lamar’s DAMN. receiving the Pulitzer Prize for Music is a good thing. It’s just not necessarily a great thing. The Pulitzers can still do much more to acknowledge and award all types of music and other forms of creation. With any luck, the judges will realize that they should follow in the footsteps of their Prize recipient and be bold, be authentic, and be a pioneer all the time, not just when it suits them.